Vincenzo Pizzino arrived at Painesville, Ohio, about 1924. He migrated to Painesville from Pennsylvania with his wife, Maria Loria, and their children. 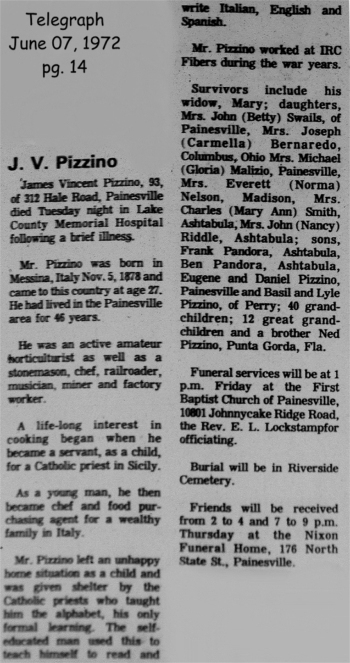 In America, Vincenzo Pizzino was known as James Vincent Pizzino. 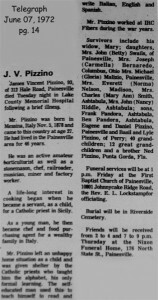 Vincenzo Pizzino, son of Basilio Pizzino, was born on Tuesday November 5, 1878, at Messina, Sicily. He married Maria Loria, daughter of Giovanni Loria and Vittoria Tangoro, on April 12, 1920. Vincenzo died on June 6, 1972, at Lake County Memorial County, Painesville, Lake County, Ohio, at age 93. His body was interred at Riverside Cemetery at Painesville, Lake County, Ohio. Vincenzo Pizzino immigrated to the United States 1905. He was about 27 years old. Vincenzo was married, with two children when he immigrated to the United States. His wife and children never immigrated to the United States. Vincenzo registered for the military draft for World War One on September 12, 1918. He was living at Wendell, West Virginia. He was employed by a coal mining company. His “nearest relative” was Teresa Pizzino who was living in Italy. 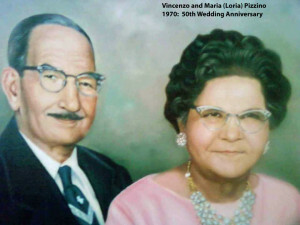 Vincenzo Pizzino’s first wife passed away in Italy, sometime before 1920. When Vincenzo married Maria Loria, Maria was a widow with four children (all under six years of age). Mr. Pizzino was employed for a number of years by the Storrs and Harrison Nursery and for the Industrial Rayon Corporation. At the time of his death, Vincenzo resided at 312 Hale Road, Painesville Township, Lake County, Ohio. 9. Nancy Caroline Pizzino was born on April 2, 1941, at Painesville, Lake County, Ohio. She married Jack Riddle on December 10, 1960, at Painesville, Lake County, Ohio. Nancy died on July 1, 2014, at TriPoint Medical Center, Concord Township, Lake County, Ohio, at age 73. Her body was interred at Riverside Cemetery at Painesville, Lake County, Ohio.